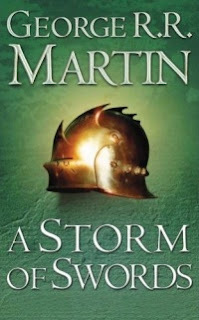 I went through this book as I watched season six on TV, and both helped deepen my experience of the other, with all the references, callbacks and plots hatched in one that paid off in the other. It made me feel like Bran checking out history through the three-eyed raven's pensieve-style magic, and gave me the best possible way to appreciate the subtle ways Martin foreshadows and extends his characters and themes, giving a sense of order to the otherwise random-seeming way he hops among perspectives and plotlines. Just as the show does, the story in the books only grows richer and more spellbinding as it wheels on. That makes it all the more jarring and painful when he takes characters away with such ruthlessness. Even when you know the beats come, they hurt just as severely. Bullet point by bullet point, the stories would seem like a gloomy death march, but the beauty and sense of joy Martin unearths as you move through his stories are what set them apart from nearly anything else ever written. He was a genius at the height of his powers when he wrote these, and even if he doesn't finish the series what he's accomplished deserves to stand as an incomparable masterpiece of an epic saga.